This volume of articles reprinted from Signs offers some of the most significant contributions to the debates on history and theory. Illustrating the uses of theories in recent feminist historical research and the often contentious arguments that surround them, the articles speak to a number of discussions, including the theoretical tradition of political economy, the importance of class relations for understanding historical events and social relationships, and the expansion of concepts from political economy to include race. Included as well are the workings of gender signification in terms of the body, moving it from its traditionally lesser position in the hierarchical Enlightenment mind/body split. A further group of articles concerns the discursive character of power relations and the dialogic quality of language. The volume will be extremely useful for feminist historians in a variety of disciplines as well as women’s studies students interested in issues of interdisciplinarity. 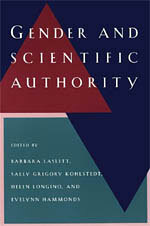 Gender and Scientific Authority is available from the University of Chicago Press.